It has recently been announced by HMRC that the Intermediary Legislation, commonly referred to as IR35, will be subject to further reforms. The IR35 law, which is part of the Finance Act, was first introduced in April 2000 with the purpose of stopping “disguised employees” from avoiding paying tax and National Insurance, but also to avoid inequality in the rights between two people performing the same job. What is a “disguised employee”? The term refers to one-person limited companies who work for a client on the basis of an off-payroll contract but whose working hour’s pattern, rights and obligations, day to day tasks and work relationships are the same as formal employees. One-person limited companies can reduce their declared annual profits by taking travel, equipment, training (and more) expenses into account. Employees are not able to do this and, if paid the same, would be paying vastly different amounts in tax. Disguised employees are paid through dividends via their limited company rather than through payroll. Dividends are taxed at a lower rate than if an individual was receiving this money through payroll. National Insurance is not applicable to dividends, which means the “disguised employee” could be avoiding paying NI, which would be paid if they were an employee. Companies who engage with Intermediaries off-payroll do not pay Employers NI, auto-enrolment Pension contributions or Apprentice Levy on the monies they pay to the Intermediary. What are the new changes to IR35? 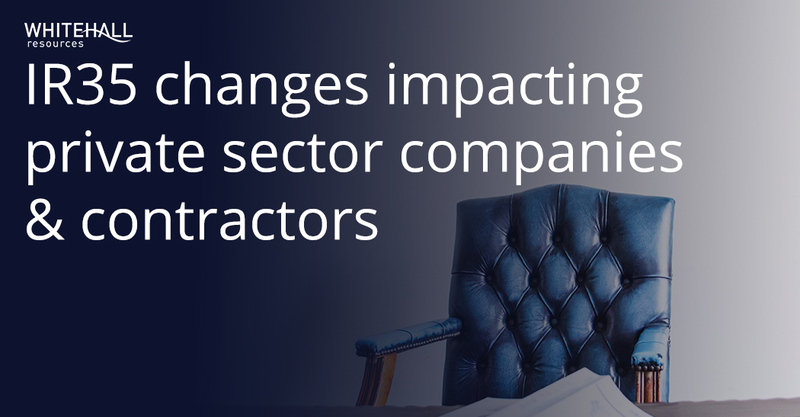 The intermediary legislation is being reformed to state that from April 2020, contractors or consultants who work under one-person limited companies (PSC’s) for medium and large companies in the private sector will no longer decide whether a working contract is inside or outside of the IR35 legislation. Instead, the client who supplies the contract is the one who will determine the category the contractor will be working under, and therefore will be also responsible for paying fines if it is discovered they have been negligent in their duty to do so. The practice of getting clients to identify the contractor’s status is not new, as it was first applied to the public sector in 2017. The main change is that it will be now also be applicable to medium and large businesses in the private sector. Why are the changes to IR35 controversial? The benefits for contractors is that, in some cases, liability associated with an incorrect determination might not sit exclusively with them, and also that some companies might give contractors a more aligned and defined contract, including working practices that reflect the independent services the contractor is to deliver that benefits them by having the freedom that a contractor or freelancer should have – in terms of set working hours, requirement to be on site, company uniform in some cases, reporting lines and various other flexibilities that help demonstrate an independent contractor is in no way a deemed employee. On the downside, risk-adverse companies might try to avoid getting fined by simply classifying all contractors as employees even if it is means both the employer and the contractor would be required to pay higher tax and NI and it might not be an accurate reflection of the relationship between the two parties. Those inside IR35 would need to be engaged under an ‘employed model’, with PAYE via an umbrella company or agency, which means restructuring their admin operations and as a knock-on effect, the fees incurred from weekly/monthly payments via an Umbrella might be higher than those incurred by annual accounting costs of a PSC, pushing up the cost of contract recruitment further. Am I a PAYE or an off-payroll contractor? Whilst the responsibility will now lie on the client to make the determination, if you are a contractor, it is important that you are able to identify what type of contract you are working on. Here are some examples on how to identify your contract status. You need to ask your employer to take time off. Your employer decides when and where you work. You are expected to “busy yourself” if the workload of the project is low. Your employer can move you to a variety of tasks. You are unable to refuse work. You can be substituted by another contractor. You are allowed to finish a contract in less time that originally agreed if the work has been completed. You work for different employers. You spent at least £1200 per year in advertising. You own or rent premises outside of your home. You can use the HMRC determination tool to find out your employment status. Naturally, your current situation might be a mix of the above guidelines, therefore we recommend contacting an IR35 expert if you are in doubt. How can I prove I am a genuine contractor? There have been recent cases in which contractors do not agree with the category they have been put under and have challenged HMRC in court after proving they are a genuine off-payroll contractor. Ensure your contract mentions a clause about substitution. Bring to work your own equipment and make sure you use it. Request to be allowed to work from home sometimes when pertinent, to enable your e-mail to record you are working from home. Pay your own expenses and keep receipts. You can find more information here on the summary of responses from HMRC and HM Treasury in regards to off-payroll working in the private sector. The UK government website should also be updated in due time, therefore ensure you keep yourself informed on the updates and changes.